Open ended play. It’s a great way to help kids build their imaginations and learn to be creative. And there’s a huge range of toys to help them out when it comes to this. We’ve picked out our fave open ended toys ready to fuel their imagination and take them anywhere they like. Awesome. The Grimm's 12 Piece Rainbow has been designed to constantly stretch kids’ imaginations. Start with the basics and use it to teach toddlers about colours, stacking and basic building. As they get older, encourage open ended play by turning the arches into bridges, tunnels or little homes for tiny toys. Now there’s a bright idea. The Wobbel Original Transparent is a balance board that’s been made for both open ended play and keeping kids active. Let them rock back and forth to increase their balancing skills, make it into a slide for their dolls or use it as a bridge. Pst, it works amazingly well with the Way2Play car track for a unique way to make a mountainous road. Love the idea of a Wobbel Board but want something a bit different? The Wobbel 360 is a great pick. 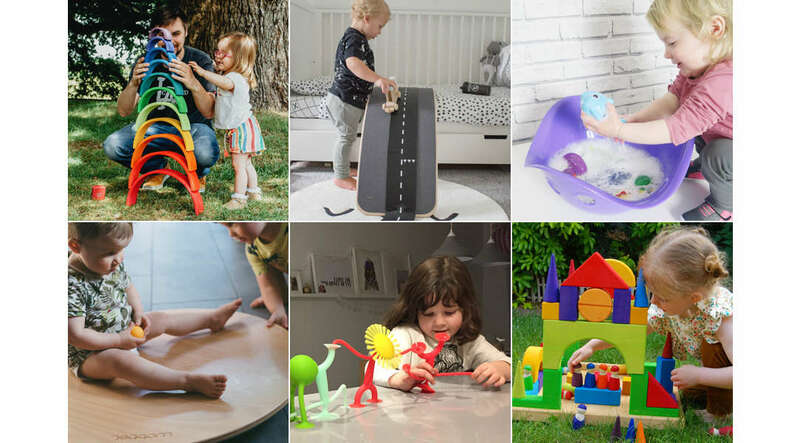 Let them spin to help with their balancing skills, or use it for creative play; whether it's as a mini roundabout for their toys, a car roundabout or as a marble run. The Moluk Oogi Junior has been designed especially to take kids’ imaginations anywhere they want to go. This stretchy, suctioned figure is faceless to let kids create their own character and great for both land and water play. Just team it up with the rest of the Oogi Family for more open ended fun. A building block set is the ultimate must-have for open ended play. And when it comes to this type of kit, the Grimm’s Basic Building Set is a perfect pick. There’s 30 chunky geometric shapes to get toddlers building towers or houses, bridges and farms. Or, just use the included wooden frame to encourage pre-schoolers to create patterns and build their imaginative skills. So there we go. Six toys to make open ended play, fun, interesting and bright. We love how they’ll help kids learn as they play. Sneaky.